Escape to the forests of Ukiah for an intimate and relaxing retreat with Pete Guinosso at rustic Orr Hot Springs Resort. Feed your spirit and your body as you enjoy a weekend of yoga, natural autumn beauty and amazing culinary delights. 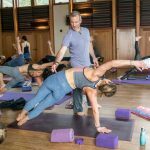 Nourish yourself with daily yoga classes with Pete and spend your days exploring the beauty that Orr and its surroundings offer just three hours from San Francisco. There will be plenty of time for soaking in the rejuvenating baths and pools throughout your stay. Acclaimed local chef Greg Lutes, of 3rd Cousin fame, will curate a unique culinary experience with two multi-course dinners. Lunch on Saturday and breakfast on both mornings round out his delicious, organic offerings. To preserve the tranquil nature of Orr, this retreat is intentionally kept small. Guests can choose from dorm rooms (gender neutral or women only) in the resort’s Creekhouse property, or the more private yurts. Our first yoga practice begins at 4:00 pm on Friday. Please plan to arrive after 12pm to settle in to the property. We will close the retreat by Sunday at noon. We look forward to sharing the practice and a soak with you! Yoga, use of the Springs, all meals & smiles.